I’m so excited to introduce another new guest blogger to the All’s Fare family! Stacey Mueller is a dear friend and mentor of mine from back in the Milwaukee area. She recently tried her hand at making homemade caramels for gifts. With 10 days left of shopping before Christmas, here’s one way you can impress your friends and family this holiday season…and avoid the crowded malls and shopping centers! My family is all about food gifts: cheeses and smoked meats, game harvested by the hunters in our group, homemade treats and home-assembled gift baskets. Last year, I visited Penzey’s spice shop (locate one near you) in Greendale, Wis., bought 4-packs of spices and turned to the staff at my local liquor store for some great wine pairings to go with the spices. This year, I’m trying to reconnect with cooking skills set aside in the last few years when I was busy with other things. My mother-in-law makes awesome cookies, so I don’t ever want to compete in that venue. My mom also makes some lovely cookies and also fudge, toffee and nut brittles. 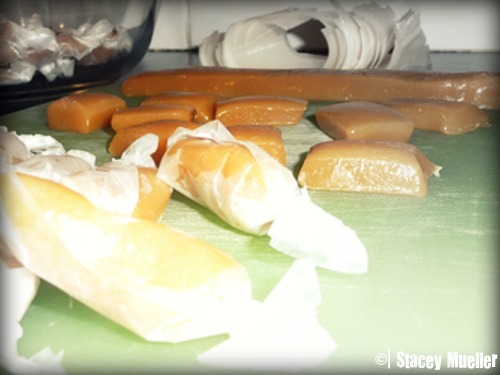 Taking a cue from my mom but also wanting to offer something different, I decided to try homemade caramels. And, since I made just about every possible mistake with the first batch, I thought I’d share the experience to help you fast-track toward rich, creamy, sweet success. This recipe makes about 6 pounds of caramels. A pound is a nice amount for a gift. A very large stock pot with a heavy bottom. Trust me when I tell you that there’s little chance your pot is too big. A silicone spoon or spatula to stir the mixture. You want to use something that will resist sticking. A baking sheet with at least a 1/2-inch rim. One or two nonstick silicone cutting boards. 1 pint milk. I used 1 percent lowfat milk, not to reduce calories (Did you notice the pound of butter to start?) but because it’s what I had on hand. Assemble all your tools and ingredients before you start. Once you have all the ingredients in the pot you’re committed to constant stirring, so get everything ready first. Caramel ingredients beginning to cook. 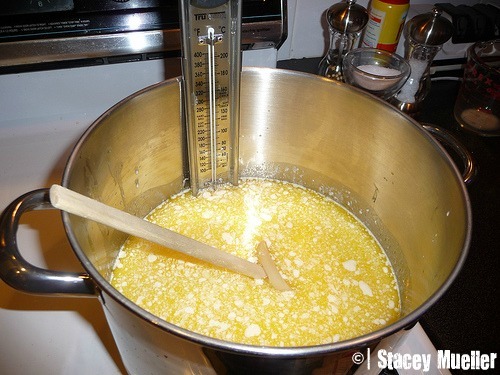 Put the butter in the stock pot and melt it gently over medium low heat. Avoid browning the butter. While the butter melts, line the baking sheet with aluminum foil. You need to cover the bottom and sides. If you need to use two pieces of foil, overlap the pieces by at least an inch. 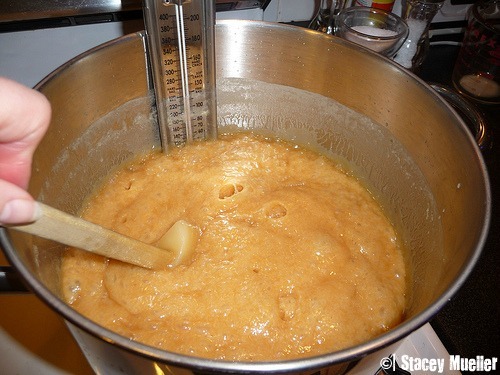 The caramel mixture is thick enough that it won’t seep between the layers if you make sure the seam is nice and flat. If you’re worried about it, overlap and fold over the seam to seal it. Use the pastry brush to coat foil with butter. Then butter it again. You don’t want to be picking foil out of your candy later. When the butter is completely melted, add the milk, cream, sugars and corn syrup. Clip on the candy thermometer, turn up the heat to medium high and start stirring. You need to stir constantly until the candy reaches 245 to 250 degrees. This takes 35 to 40 minutes, so make yourself comfortable. A note about temperature: Temperature determines the consistency of your finished candy. Cooking to 250 degrees will yield candy with a firm bite. Not hard, but firm. Cooking to 245 degrees produces a more tender bite. I cooked my first batch to 250 and thought it was pretty good, but I wanted to mimic the slightly softer texture of my favorite gourmet caramels. Pulling the candy from the heat at 245 gave me the result I was looking for. 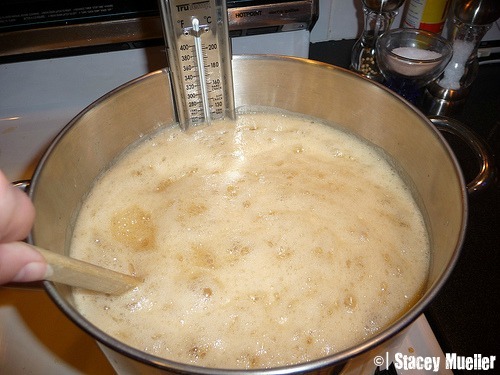 The mixture increases in volume as it boils. So, you’re cooking and stirring, and by now you really wish you had poured an icy cold beverage before you started. You may become alarmed as the candy mixture seems to take on a life of its own. It increases in volume as it boils, which is why you need a bigger pot than you might guess. Only my husband rushing with a ladle prevented a sticky sweet boilover the first time I tried this. As soon as the candy gets to 245 or 250 degrees, get it off the heat. Quickly stir in the vanilla, then pour the cooked mixture into the buttered, foil-lined pan. Allow the candy to cool to room temperature. Heavy lifting courtesy of my hubby, Frank. Walk away for a few hours, or you can start cutting 4-inch squares of waxed paper for wrappers. I considered using Wilton cellophane candy wrappers, but I could only find red ones, and it wasn’t the look I wanted. I also wasn’t sure if the caramels would stick to cellophane. In spite of needing to cut the squares, I like how the waxed paper looked and worked. Cut and wrap pieces as you go. Once the candy has cooled, it’s time to start cutting. Spray the cutting board and knife lightly with cooking spray. 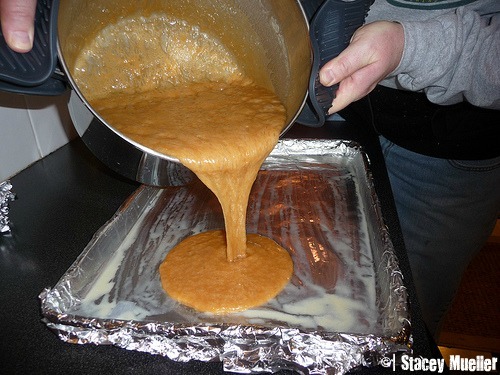 Flip the block of caramel out onto a cutting board and pull away the foil. This is where you learn whether you buttered it enough. Cut the block of candy in half crosswise, and transfer half to another cutting board or back to the buttered foil. Cut the candy crosswise in 1-inch strips and then into bite-size pieces. This sounds easier than it may be. If you made a firm batch, you’ll meet some resistance as you cut. If you made a softer batch, it will be a little stickier. Be patient and work slowly. When your knife gets sticky, rinse it under hot water, using the vegetable brush to remove the caramel. Dry the blade with a paper towel, coat it with cooking spray and continue cutting. If you made a soft batch, the cut pieces will stick together more than a firm batch will. With the soft batch, I found it helpful to cut a strip and wrap the pieces before moving on to the next strip. Cupcake boxes and wired ribbon make your caramels ready for gift-giving. 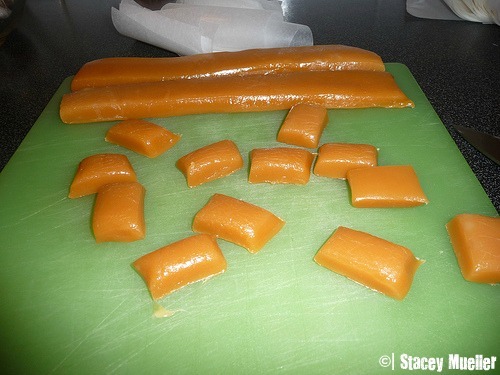 An hour and a half later, you’ll have about six pounds of homemade, wrapped caramels. I found that a four-pack cupcake box holds a generous pound of candy. I placed the boxes on a kitchen scale as I filled them to be sure I filled them evenly. 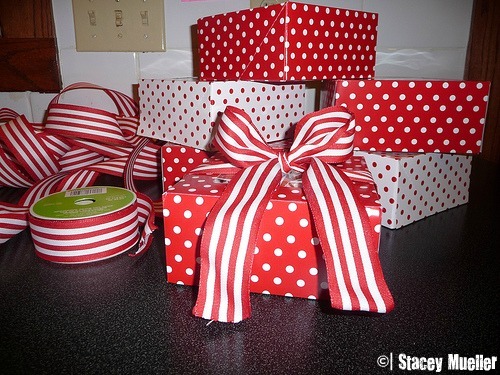 Tie a bow around each box with wired ribbon, and you’re done. I’m exhausted even as I write this, but I know these gifts will be appreciated, and I avoided many hours of Christmas shopping insanity! This entry was posted in Cuisine - Desserts, Places - Milwaukee, Recipes and tagged candy making, caramel, Christmas, gift ideas, guest blog, Penzey's Spices, Stacey Mueller, Wilton by Christina. Bookmark the permalink. Thank you for posting your experience with how hot to get it relative to the texture you want for your caramels. My first effort came out softer than I wanted and appreciate your guidance.